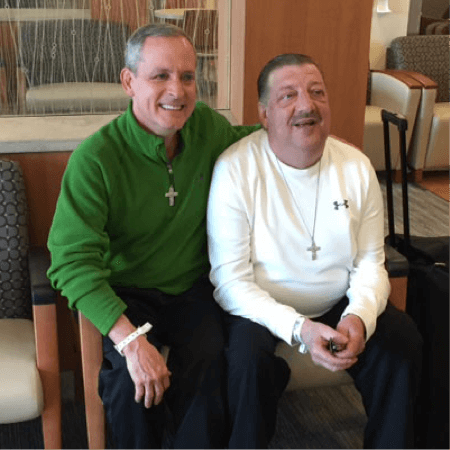 Jim’s story starts over 30 years ago, when he began working as a nurse at a Franciscan sponsored healthcare system in Pennsylvania. Jim first met Matt in the halls of this hospital. They were both just starting their careers, and bonded over being some of the only men (and class clowns) in their female-dominated profession. Over their years of friendship, Jim watched as Matt battled numerous health-related issues. Matt always remained positive, never complaining or losing hope. Last summer, though, Matt’s kidneys were failing, and doctors told him that he would need a transplant in order to survive. Jim admits that he originally offered to donate his kidney half jokingly. However, when all six of Matt’s siblings were not matches, suddenly Jim’s offer became more serious. After discussing his decision with his family, Jim underwent the necessary tests. Remarkably, Jim was found to be a match for Matt, and the surgery was scheduled.